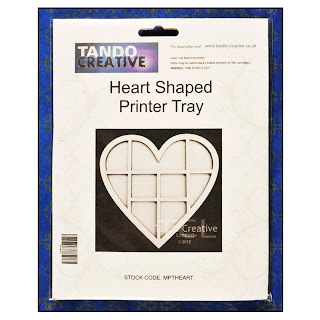 I have chosen to alter a Tando Heart printer tray. As I wanted to add a mini book, I cut the inside frame to make room for it. The "compartments are built up in three layers of chipboard , so i was able to cut and change them quite easily. 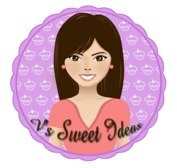 This week we are sponsored by Sweet Ideas who are giving $10 to spend in their store. I painted the edges with white acrylic paint and then on the second coat, added some brown.I stamped randomly over this with Stephanie's stamps and I then added some crackle glaze over the top. I used some MME miss Caroline paper to the background before i stuck the "compartment" layers on. The butterfly is die cut and then embossed with stampendous aged ivory embossing powder. I had some metal charms free with a recent paper craft magazine and used some of these to fill the compartments. I have inkled every page and also stamped with a stamping up floral stamp around the edge of each page. The flowers were just punched circles ,spritzed with glimmer mist and scrunched. when dry, i added a brad and punched some leaves. Do pop over to the main blog to see the wonderful projects from the rest of the DT. This is absolutely gorgeous!! So different and just... Fantastic! I love this! Oh sue, gorgeous printers tray. Love everything about it. Awesome job!! This is gorgeous Sue!! So many great details, love how you stamped around the edges, and then gave it crackle. The mini is adorable too!! oh my word Sue.. That is amazing.. Love love love the crackle effect and all your wonderful elements.. Absolutely beautiful..
Sue - this is absolutely gorgeous, stunning to the nth degree! That is so stinkin cute. OMG I love it. Those flowers are gorgeous!!!! It's just all to perfect. This is gorgeous! I have always wanted to make a memory tray, but refused to pay for a big one. I need to try one like this since I love how this looks! WOWZERS, Sue! This is stunning! Beautifully embellished!